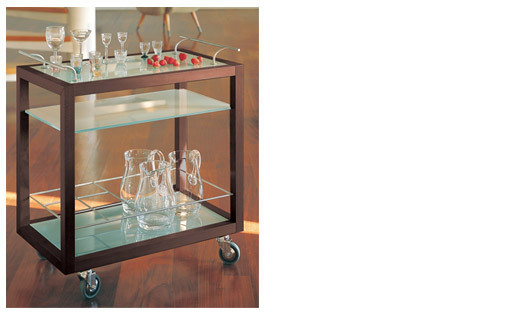 A bar cart, like this one from designstudiofurniture.com is an elegant solution for a starter bar in a smaller space. You’re finally throwing your first whatever in your new place. Sure it’s small, but you still want your guests to feel welcome and for everyone to get along great before you pack all six of them around your tiny dinner table. Here are the basics you’ll need to stock your drinks tray, cart or bar. Vodka, Gin, Bourbon, Scotch ( I prefer a single malt, but a good blend like The Famous Grouse or Johnny Walker Red works too) Tequila, Rum, Brandy, Dry Vermouth, Sweet (or Red) Vermouth, Triple Sec. if your space is limited to an occasional table top or bar cart, stick to the “regular size bottle” or “Fifth” of 750 ml. You’re going to need a few tools to do this right. Speed pourers (those spouts jammed into the necks of the bottles that you see when you order at the bar) can be helpful for mixing a large batch or two. A standard shot glass makes a good measure. A good hand-held juicer, small tray or plate for cutting up garnishes and a sharp knife will see much service. There is a great debate about the shaker, versus the Boston shaker (a glass and metal cup combination) or the pitcher. They all have their place. Bartenders will tell you that the Boston Shaker is easier to handle when you’re making a lot of drinks since it comes apart more readily than its all metal cousin after being half frozen by your shaking. A tall, slim martini pitcher is an elegant alternative to both. A word about glasses. I wouldn’t invest too much… A few highball, double old-fashioneds and cocktail (Martini) glasses should join your collection of wine and champagne glasses. by Charles Schumann. Soon you won’t need it to mix a perfect drink for a bevy of delighted guests, but it’s still nice to throw in a surprise every once in a while — like a French 75 on Armistice Day. This entry was posted in Entertaining and tagged bars, Entertaining, gear. Bookmark the permalink.